With more than 90 percent of our state's caves are in private ownership, it's clear that landowners hold the key to managing this invaluable resource. 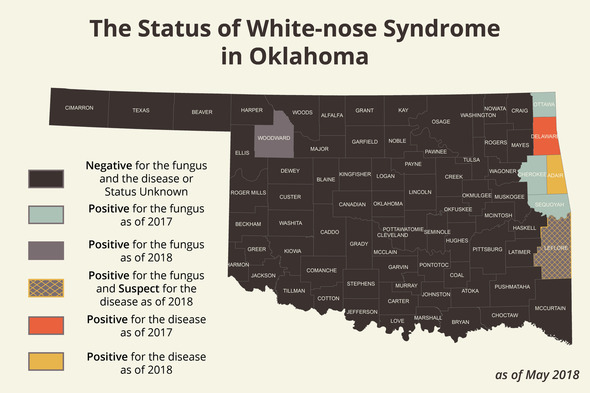 Unfortunately, Oklahoma cave managers are facing new challenges with the confirmation of white-nose syndrome, a relatively new bat disease. White-nose syndrome is caused by a fungus, Pseudogymnoascus destructans, that grows on hibernating bats' muzzles and wings. It is thought this fungal growth irritates the bats, waking them when their food resources – namely insects – are minimal. Because these wakened bats use valuable stored energy and are likely unable to refuel by eating, they may not survive the winter. Wildlife biologists with the Oklahoma Department of Wildlife Conservation are concerned how this disease will affect our bat populations in the future. 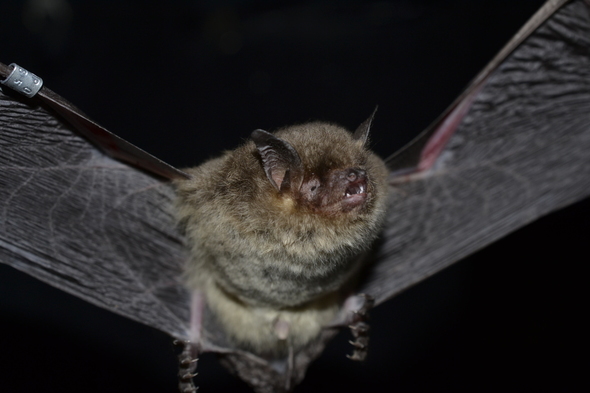 To help you navigate this new challenge, we offer the following tips for preventing the spread of the fungus, provide information about Oklahoma's bats and caves, and resources to learn more about this new disease. Bats and their cave environments are incredibly sensitive. Because of this, Wildlife Department biologists recommend limiting access to public and private caves, when possible. This simple action can not only help prevent the spread of the fungus, but also helps protect our bats from human disturbance. If overwintering bats are awakened or disturbed, they may use their valuable fat stores instead of hibernating their way through the season. Conversely, if bats are disturbed in the spring and summer they may accidentally drop their pups to the cave floor while attempting to escape. If visitors are allowed in privately owned caves, the Wildlife Department strongly recommends the visitors follow proper decontamination procedures. Cave owners also have the option to require any cave visitor use equipment and supplies that have not been in any white-nose syndrome confirmed or fungus positive counties in the nation. Biologists have been testing for the disease and associated fungus since 2010 in public and private caves. A privately owned Delaware County cave first tested positive for the fungus in the winter of 2014–2015, and was confirmed to have white-nose syndrome in the winter of 2016–2017. The following map outlines the current status of white-nose syndrome in our state. Oklahoma's bat diversity is incredible -- at least 24 species of bats have been documented in our state. All of our bats are active at night, and feed on insects. Learn more about these flying mammals in the "Bats of Oklahoma Field Guide." Our state has been blessed with two major cave formations; limestone caves are found in the eastern-third of Oklahoma while gypsum caves are primarily found in our mixed-grass prairies. At least 14 caves in Oklahoma are over 1 mile long. The longest recorded cave in the state is 8.9 miles long. At least 250 miles separate Oklahoma's eastern limestone caves and western gypsum caves. At least 11 caves have been recognized by the Oklahoma Natural Areas Registry Program. Biologists are continuing to learn more about white-nose syndrome and the fungus that causes it. Learn more about the research efforts, what's going on around the nation, and more at whitenosesyndrome.org. 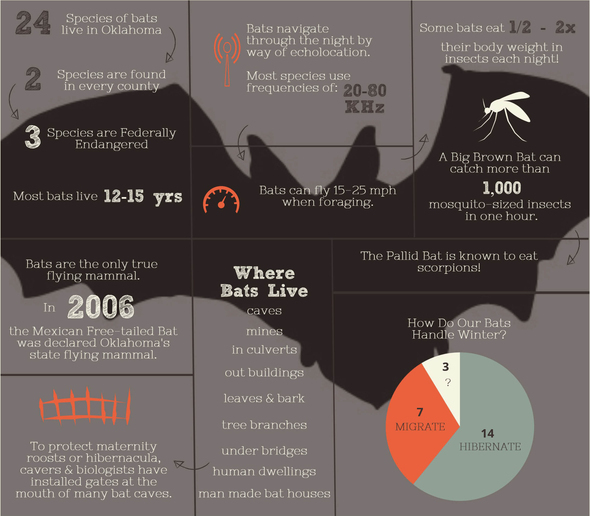 Want to know more about Oklahoma's bats? Want to know more about Oklahoma's Natural Areas Registry Program?